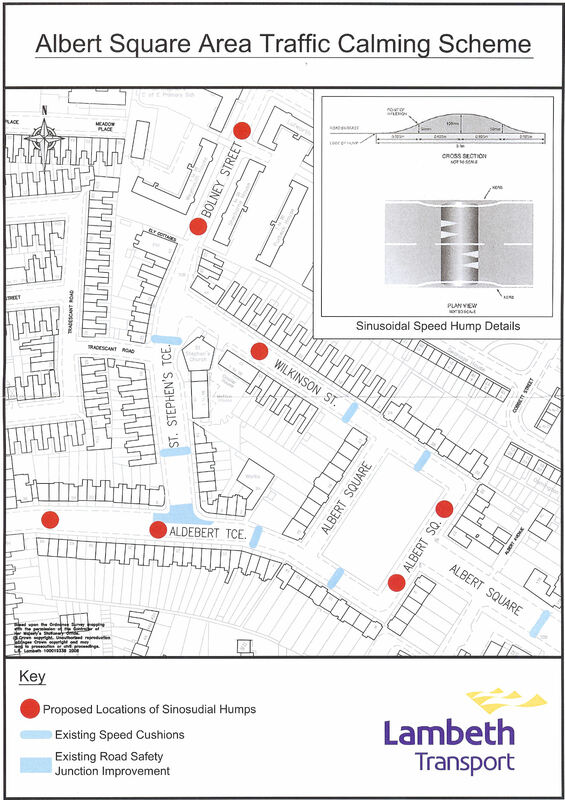 The deadline is on us for responding to the consultation by TfL and Lambeth council on the proposed installation of seven “sinusoidal road humps” at locations shown in red on the map. The pack which came through my letterbox said there was a questionnaire about the proposals, but didn’t actually include one – though there was an email address – gbull@lambeth.gov.uk – for more information. The objective of the scheme is clearly one we all share – these proposals will, we are told, “lower traffic volumes, limit vehicle speeds, reduce collisions and improve road safety”. That’s a lot for seven humps to achieve, and there’s some reason to doubt that it will fulfil the planners’ hopes. The first problem is that this looks as though the completely piecemeal approach to traffic planning is continuing: none of this takes us any closer to seeing a coherent approach to planning for the whole of the South Lambeth Road – Clapham Road – Harleyford Road triangle. The deeper problem is that key components of the traffic management system seem to be off limits in any overall assessment of what’s going on, most importantly the traffic lights at the end of Aldebert Terrace which made the Albert Square – Aldebert Terrace cut through much more attractive. So having generated traffic through doing one thing, we have lived through a whole series of measures designed to counteract the effect of the first one. That’s not to say that adding more humps is a bad idea, even if it is born more of desperation than of strategy. Interestingly, the Department for Transport seems pretty sceptical about the advantages of (more expensive) sinusoidal humps over the common or garden variety. Whatever your views, tomorrow is the last day for sending them in, using the questionnaire if you were lucky enough to get one, or simply by email to the address above if you weren’t.